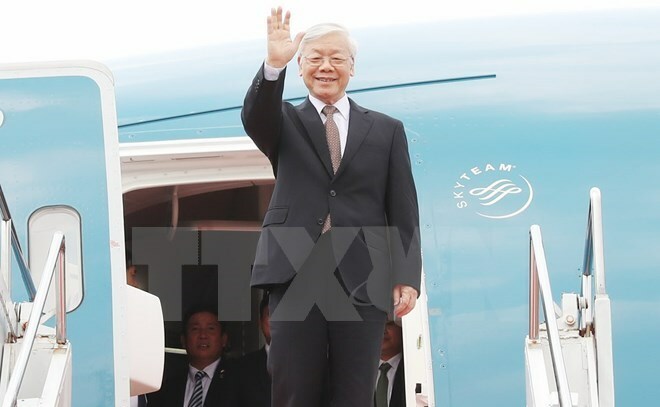 Hanoi (VNA) – Party General Secretary Nguyen Phu Trong arrived in Hanoi on August 26, concluding his Indonesia and Myanmar tour. During his stay in Indonesia from August 22-24, the Party chief and the host country’s leaders discussed measures to boost bilateral ties, affirming their determination to maintain their trustworthy friends with shared values and interests. The two sides also concurred to coordinate closely with other ASEAN countries to maintain intra-bloc solidarity and the central and leading role of ASEAN in the regional architecture, realising the targets of the Community. The two sides also signed six cooperation agreements. While staying in Myanmar from August 24-26, Party General Secretary Trong and Myanmar’s leaders reached orientations and solutions to beef up the ties comprehensively, while agreeing to continue working closely and supporting each other at international and regional frameworks, especially the ASEAN, the East-West corridor and the Mekong sub-region. On the occasion, the two sides issued a joint statement on the establishment of the Vietnam-Myanmar comprehensive partnership, and signed cooperation deals. Also on August 26, Party General Secretary Nguyen Phu Trong sent a message to Myanmar President Htin Kyaw to thank the State leader for his warm welcome.